The Documents and Media portlet is non-instanceable. This means that each page on your portal can host at most one such portlet. Furthermore, if you add multiple Documents and Media portlets to pages in the same site, these portlets will share the same data sets since they are scoped by site by default. However, you can add multiple Documents and Media Display portlets to a page. Then you can choose content from actual Documents and Media repositories to display. Remember that users, by default, have their own personal sites with public and private pages. They can use their personal sites to host Documents and Media portlets for storing or sharing their own files. The default view of the Documents and Media portlet displays the contents of the Home folder. The links on the left side of the portlet windows are filters. You can use these filters to choose what you want the main window of the portlet to display. Recent Documents displays documents users have recently uploaded, edited or downloaded. My Documents shows your documents; in other words, the documents you have uploaded. Basic Document and the document types listed below it are also filters. If you click on one of these filters, the main portlet window shows only documents that belong to the selected document type. When you add custom document types, which we discuss below, they are added to the filter list. Next, let’s look at how to navigate around Documents and Media. Download: lets you download the document. Get URL: displays the URL of the document on the server. Get WebDAV URL: displays the WebDAV URL of the document on the server. Specify this URL as the file name when opening the document from Microsoft Office. Edit: lets you change contents of a document, point it to a different file, change its title, description or document type, or add tags, categories or related assets. Move: lets you choose a new location in the Documents and Media repository to store the document. Checkout/Checkin: prevents others from modifying the document while you are working. Other users can still view the current version of the document if they have permission. You can check the document back in when you’re done working. Permissions: allows you to configure file-specific permissions for the document. Delete: lets you remove the document from the Documents and Media library. If comments are enabled, you can also view comments, add comments or subscribe to comments about documents. Comments are enabled by default. The menu at the top of the Documents and Media portlet contains Actions, Add, Sort By and Manage buttons. There are also buttons for switching between icon view, descriptive view and list view. If there are lots of documents in the Documents and Media library, the search field can help you find the documents you’re looking for. If your portlet contains more documents than it can display at once, you can use the navigation tool at the bottom of the portlet window to either switch your view to another page or configure the page to display more documents per page. The Actions menu will only be displayed if you have selected one or more documents with the check boxes. Cancel Checkout: lets you check in a document that you had checked out but did not make any changes to. Using this option will prevent the Documents and Media portlet from incrementing the document’s version number and saving an identical version of the document. Checkin: lets you check in a document that you have edited. Its version number will increment and the previous version will be saved. Checkout: lets you check out a document that you would like to edit. This option prevents anyone else from modifying it while you are working. Move: allows you to choose a new location for a document or folder within the portlet’s file system. You can move multiple documents and folders at the same time. Moving documents and folders is also possible via drag & drop. Delete: allows you to remove a document or folder from the portlet. You can delete multiple documents and folders at the same time. From the Add button, you can add documents, folders and shortcuts just like on your local file system. Folder: lets you create a new location in your portlet’s file system. Shortcut: allows you to create a shortcut to any document that you have read access for. You can set permissions on the shortcut to specify who can access the original document through the shortcut. 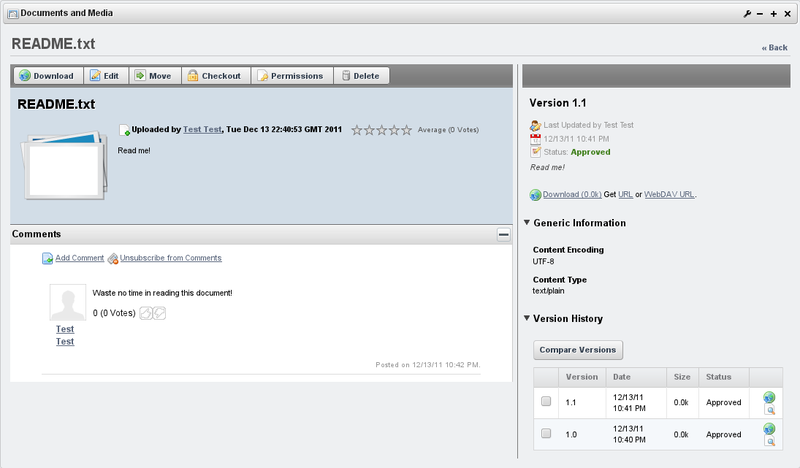 Repository: is a new feature of Liferay 6.1. This option allows you to add an entirely new repository to your Documents and Media portlet. To do this you need to specify the repository type and choose an ID. If you are using the AtomPub protocol you’ll also have to specify the AtomPub URL. Multiple Documents: allows you to upload several documents at once. Basic Document: allows you upload a single file that you would like the default document type, “Basic Document,” to apply to. By default, basic documents are not described by any metadata sets. The remaining items in the Add menu are default document types that are each described by a unique metadata set. When you add a document belonging to a specific document type, you’re presented with a form to not only specify the file to upload but also to fill out the fields defined by the document type’s metadata set. We describe the “Contract” document type by way of example. Contract: lets you upload a file that you would like the “Contract” document type to apply to. This document type is intended to be used to describe legal contracts. By default, contracts are described by effective date, expiration date, contract type, status, legal reviewer, signing authority and deal name fields. Document types are discussed below. Any custom documents types that have been defined also appear in the Add menu. If a document type has been created that matches the document you would like to upload, you can select that document type from the Add menu. This will associate the metadata fields associated with the document type to your document and you will be asked to fill out the fields. You can sort the items displayed in the main window of the Documents and Media portlet using the Sort By menu. You can sort by title, create date, modified date, downloads or size. Title: lets you alphabetically sort documents by title. Create Date: lets you sort documents by the time they were created. Modified Date: lets you sort documents by the last time they were modified. Downloads: lets you sort documents by the number of times they were downloaded. Size: lets you sort documents by how much disk space they use. The Manage menu allows you to view the names of document types and metadata sets, as well as the last times they were edited. Document Types: shows you a list of defined document types. Metadata Sets: shows you a list of defined metadata sets as well as their portal IDs.